Single 23-year-old Kazama Masamune... has a kid? During the season of cherry blossoms, his beloved passes away. He happens to meet a little girl outside work and realizes she is his daughter who was raised in secrecy by his lover. The worst spring of his life is transformed into a painful yet vivid time. My Girl was adapted to a live-action drama which aired from October 9 to December 11, 2009. My Girl looks like a simple tale of parenthood, but it turned out to be so much more. It’s about responsibility, about the will to let go and confront one's sorrows, about how one adjusts to change, and about what gives fulfillment and happiness in life. It's about how to deal with insecurity, how to believe in oneself, and how to consult others instead of bottling up ones' emotions. It's not only about how to help others, but also how to impose on others when one is in need. It's about the difference between being kind, and being considerate of others' feelings. It’s about being both a responsible father and a respectable son. The story begins when a distraught guy accepts his daughter, who he never knew he had, after being devastated by the passing of his wife. From that point onwards, complementing the theme of parenthood, My Girl enriches the reading experience with tons of poignant drama and meaningful lessons. What's a brilliant story without an endearing cast? Thankfully, My Girl delivers, and delivers big time. The main character, Masamune, is an insecure, lovesick, but charming and responsible father. His little angel, Koharu, always looks out for Masamune in the sweetest of ways. Beyond that, there’s Masamune's wise father, Masamune's foul-tempered but earnestly compassionate mother, Masamune's kind landlord, Koharu's rowdy and tsundere playmate Shuu, friends, and more. All serve their roles very well and get their fair share of characterization, often used in a way that brings out the best of their character. From the characters, it is obvious that My Girl has a powerful vision of humanity: that even in tough situations, in times of unrest and dissatisfaction, or when people are incapable of expressing their true feelings, they are truly beautiful inside. My Girl hits again and again with the feels train, never relenting until the end. It’ll likely make you tear up multiple times, since My Girl is just so potent at dramatic execution, playing around with emotions like it’s nothing. There's no doubt that My Girl is a drama; one that is filled with moments of sadness and pain. However, it is also the ultimate feel-good. The sad moments are always, without fail, beautiful and heart-warming, and the general portrayal of humanity is one of hope and of earnest optimism. Unlike "Watashitachi no Shiawase na Jikan" (Our Happy Time), which Sumomo Yumeka simply adapted into manga form, My Girl is her magnum opus. Her original story. Her heart and soul, poured into this work. Thank you, and congratulations. You touched yet another heart from halfway across the world. Before, you guys start reading my review. I need to say 2 things! 1. My review contains minor spoilers, I tried my best to keep it low as possible to not to ruin the experience for you. 2. I have compared it Usagi drop (if you are not familiar with it) it's somewhat same story, settings and atmosphere. Plot: Single 23-year-old Kazama Masamune realized, he has a kid. During the season of cherry blossoms, his beloved passes away. He happens to meet a little girl outside work and realizes she is his daughter who was raised in secrecy by his lover. -This manga is a hidden gem, it really gave me that complete satisfy feeling which I couldn't get from Usagi drop manga's ending. It's a really beautiful mid short story about a single father. All, I have to say about the story "My Girl" is that, it hits again and again with the feels train, never relenting until the end. I am writing this review wishing that more people would take interest in reading this manga. The story is very beautiful, realistic, and full of emotions. The story is episodic and each arc has its story to tell which always conclude perfectly. The art is very different to your typical manga (in a very likable way) and I think that its very suitable with the flow of the story. I would say the art and the story compliment each other perfectly that I wouldn't know how it would be made better. The characters were perfect, although you wouldn't see that much growth on the other characters I am very impressed by the character development of Koharu and Masamune. Koharu's character is mature and compassionate to the feelings of other people. She always try to not give burden to Masamune, afraid that he would also loose him, that is why she isn't able to express her emotions more freely. While Masamune give's his best to to give the emotional support to Koharu while trying to move on with his love to Youko, Koharu's mother. Enjoyment, I find this very enjoyable to the extent that I would write a review so that other people would also read this and be able to feel this unexplainable happiness and content from reading a My Girl. At the very least I wish I have the right words to describe how gorgeously made this manga is (maybe i'll leave that to the expert). I definitely recommend this manga especially to those who love the Natsume Yuujinchou feeling. To Ms Sahara Mizu, thank you for creating My Girl and if a manga would be able to understand I hope you know it was " A pleasure to read you". 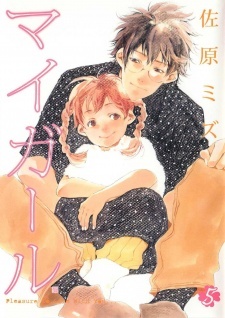 I began reading this series because I was looking something similar to Yotsuba, but it turned into to be the opposite. Yet, it was not a bad series, and I would have rated the series higher if it was not for the male lead. The mc met his lover as a freshman in high school, while his lover was a senior. Later, his lover leaves him to study abroad and does not hear from her for five years. Next time he hears her name, she passed away and was secretly raising their child. No DNA test, and takes the child as it was his. Also, the mc does not have any romantic relationships with other women because he is unable to forget his lover during all those years. A year or more passes with him and his daughter, and he is unable to move on from a lover that left him in high school. The best character, Koharu, his daughter also suffers and misunderstand situations blaming herself because the mc is unable to move on. The rest of the characters are not bad, from the mc's parents, to his mother-in-law, and Koharu's friend's and their families, including his deceased lover. The less likable character I found was the mc.